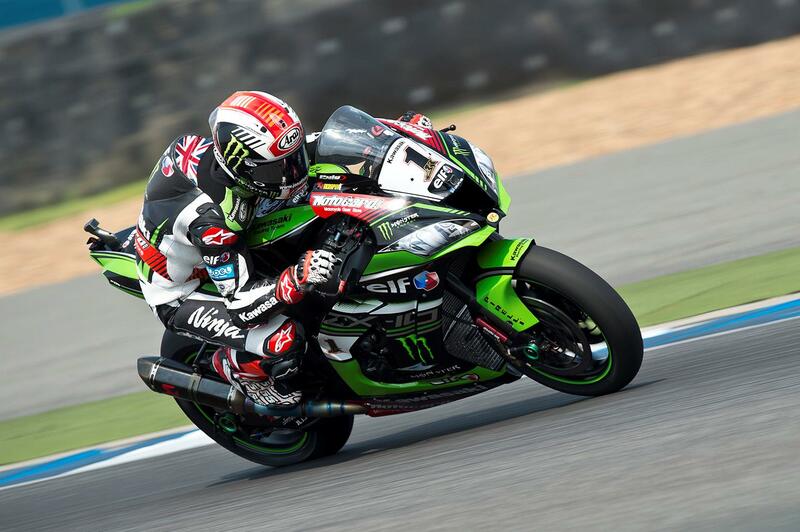 Jonathan Rea (Kawasaki Racing Team) took his third race win of the 2017 season in peerless fashion, and at lap record pace, after running in the lead for all 20-laps of the 4.554km circuit in Thailand. Despite the high track temperatures Rea set a remarkable run of 1’33 laps to ease away to an eventual margin of victory of 6.279 seconds. He is now 15 points in the lead of the championship. Overhauled long time second place runner Marco Melandri (Aruba.it Racing - Ducati) for third. Having taken an early lead from pole position Rea took out a gap of almost 0.7 seconds over Melandri after just two laps. He set a new lap record of 1’33.437 on lap two, and then went just a little faster on lap five, with a 1’33.436. Michael van der Mark (Pata Yamaha Official WorldSBK Team) and Alex Lowes (Pata Yamaha Official WorldSBK Team) finished fifth and sixth. There was heartbreak for Eugene Laverty (Milwaukee Aprilia) who looked set for a decent run but his bike stopped a lap from the end of the race. Jordi Torres (Althea BMW Racing Team) was seventh, Leon Camier (MV Agusta Reparto Corse) eighth after another slow start and fast finish. With Laverty out, Nicky Hayden (Red Bull Honda World Superbike Team) was ninth and Stefan Bradl (Red Bull Honda World Superbike Team) tenth. 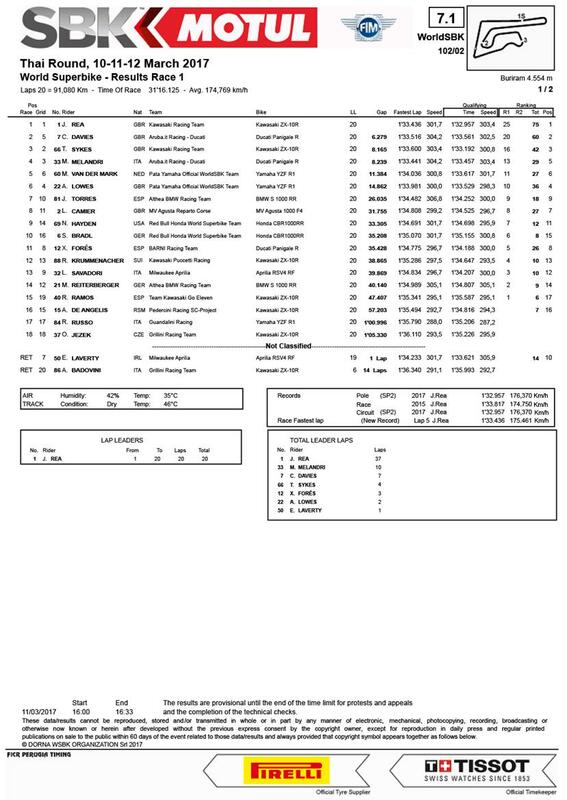 Xavi Fores (Barni Racing Ducati) and Randy Krummenacher (Kawasaki Puccetti Racing) completed the top 12. With race two coming along in 24 hours, the championship points are Rea 75, Davies 60 and Sykes 42 and Lowes 36.